For I do not want you to be ignorant of the fact, brothers, that our forefathers were all under the cloud and that they passed through the sea. They were all baptized into Moses in the cloud and in the sea. The all ate the same spiritual food and drank the same spiritual drink; for they drank from the spiritual rock that accompanied them, and that rock was Christ. There are several things in these verses that are interesting and often overlooked as we look at this passage (1 Corinthians 10:1-4 NIV) There was a dual baptism, or a one-two punch baptism, or a one-in-one baptism for the Israelites as they followed YHWH. There was the cloud and there was the Sea. Many times we overlook the “cloud,” and concentrate on the “sea” part. It all occurred at the same time but there are two separate elements involved. He provided for them as they did the impossible (walked through the sea) and He was visibly present to them in the cloud that overshadowed and/or enveloped them. What a wonderful demonstration of His love and His care! The children of Israel complained about their food, their safety, and each of their provisions. They perceived God as not meeting their needs, yet He provided everything. 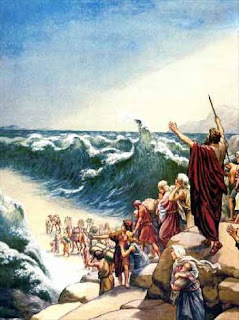 In the crossing of the sea, there was the obvious walking through on dry land. With the Egyptian army at their backs, our Lord opened a way when there had been none. This is true provision. Then of course, He drowned their enemies. More provision. They complained about Manna. The food He sent. They grew weary of it, yet they were not ill because of it but well and strong. They complained of thirst so the Lord brought water from a rock, yet they complained over and over again. What they ate and what they drank was God’s provision for them — verse 4 tells us that Christ was the Rock of water (and the manna by implication). In other words, God’s present provision is always some way of expressing Jesus Christ to us. Of course, this incident is many, many years prior to the incarnation. Yet, Christ in God was and is the provision for the people of God. To reject the provision or to complain about the provision, is to misunderstand and disregard the nature of the provision. The provision is always Jesus Christ. We can be bold to say that Jesus Christ is the only provision of God. That encompasses everything. I am carefully examining my heart and my speech. I want more of the Lord revealed in my life, therefore I must begin to trust that my circumstances are of His design and I am to receive Him in the events. Even when I may not like them, or even if they cause me pain and discomfort. Lord, You say in Ephesians 1:18 that the eyes of our heart either are opened or can be opened. Please do that for me today, and I open my mind and emotions to perceive and receive a demonstration of Your love for me in my today’s moments.